“Grandest”? Not necessarily. 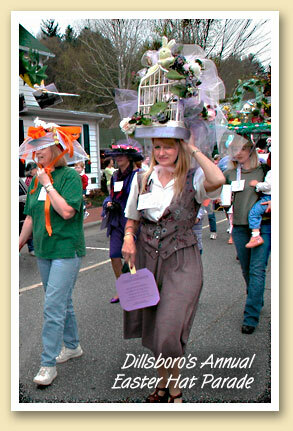 In Dillsboro’s annual Easter Hat Parade, participants are more likely shooting for the “funniest”, the “most unusual” or the “most outrageous”. Led by a fleet of restored antique cars, followed by the many hat contestants and featuring the Easter Bunny, the parade begins in front of the Town Hall on Front Street and circles the two-blocks of downtown Dillsboro. Awards are announced after the Parade. Ribbons are given for the Prettiest, Funniest, Largest, Smallest, Most Unusual, Most Easter-like, Best Smelling, Cutest, Most Outrageous, Best In Show and “Poofiest” hats among other unusual categories. There is even a ribbon awarded to the Best Animal in Show! At 10:30 AM Dogwood Crafters will offer assistance making hats. And every half-hour beginning at 10:30, there’ll be egg hunts for different age groups across the street from Dogwood Crafters. Feeling creative? Make a hat and join the parade.